The Jungfernheide location is situated in the north-western part of the Ringbahn orbital railway, not far from Charlottenburg Castle. The main entrance is in Building A3 which can be seen in the lower of the two photos. Please note that you must present your ID or driving licence at the entrance. 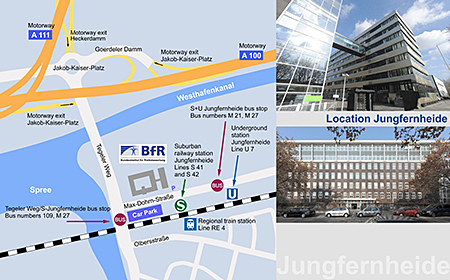 Due to the many options and possible disruptions, we recommend that visitors view the latest connections at www.bahn.de, www.bvg.de or the mobile app of their choice, destination stop: "Jungfernheide Bhf (S+U), Berlin" or “Jungfernheide Bhf (Berlin) (S+U)”. To reach the institute buildings, take the exit in the direction of Tegeler Weg. direct with U-Bahn (subway) Line 7.
direct with Bus X9 in the direction Flughafen Tegel. with the S-Bahn (urban railway) to Westkreuz and then onto the Ringbahn with S-Bahn Line 41. Or: from from Bahnhof Friedrichstraße with U-Bahn Line 6 in the direction Alt-Tegel to Wedding and then onto the Ringbahn with the S42. direct with Bus X9 in the direction Zoologischer Garten (10 minutes). S9 to Treptower Park and then onto the Ringbahn with the S42. Or: S45 to Südkreuz and then onto the Ringbahn with the S41. Other option: Bus X7 or 171 in the direction of Rudow, then with U-Bahn Line 7. Each trip takes approx. 1 hour. Autobahn 100: exit “Jakob-Kaiser-Platz”; A 111 (from the north): exit “Heckerdamm”; from the city centre via Ernst-Reuter-Platz, Otto-Suhr-Allee, Tegeler Weg. There is usually only public parking in the surrounding streets. Please use a navigation system if possible.